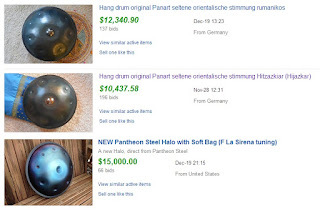 has long been one of the most used (if not always the most popular) marketplaces, for buying and selling HandPan - providing a handy (if often higher priced) platform for purchasing a pan, for those unable to travel to collect in-person from a maker, those too impatient to wait on a list, the unwitting, those who prefer the security of having an established middle-man, and those in search of a particular “Holy Grail”. officially recognises the HandPan instrument-type, by awarding it its own sales category. Category number: 181236, a new subcategory of World Drums.